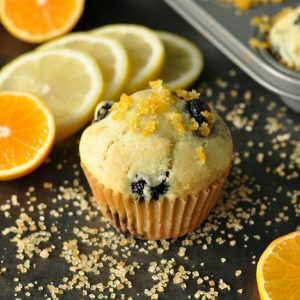 Made with berries frozen at their peak and topped with freshly zested citrus sugar, these delicious bakery-style blueberry muffins are fluffy, flavorful, and a little bit fancy! Pre-heat oven 375 degrees F.
Line 12 muffin cups with parchment paper liners and set aside. In a medium mixing bowl, combine flour, 3/4 cup granulated sugar, baking powder, and salt. In a large bowl, whisk together eggs, almond milk [or milk] and 6 TBSP melted butter. Next slowly sift in the flour mixture while stirring gently with a fork to incorporate until just mixed. Batter should be thick, sticky, and slightly lumpy. Use a silicone bowl scraper to gently fold in the blueberries. Bake at 375 degrees F for 20-25 minutes or until an inserted toothpick comes out clean. While the muffins bake, stir together orange zest, lemon zest, turbinado sugar, and sugar. Once done, brush piping hot muffins with melted butter immediately and top with zested sugar. Allow to cool a bit on a wire rack before diving in, molten blueberries are a force to be reckoned with! Enjoy! baking tip: Snag a package of parchment paper baking cups for this recipe [and all your favorite muffin recipes!] for a naturally non-stick way of scoring the perfect muffins. No crumbs left behind! For muffins topped with glorious texture and crunch, I used a combination of granulated and turbinado sugar to sweeten the citrus. If preferred, skip the crunch by replacing the raw sugar with regular brown or white sugar. These muffins are great both ways!